Aivazovsky was a true master of the landscape. Each of his paintings is a real discovery of the beauty of Russian nature. Today we all hurry somewhere and just do not have time to stop and notice the special charm of the surrounding world. The artist helps us to understand that true splendor is hidden in perfectly ordinary paintings. Aivazovsky depicts the winter nature. This is a real fairy tale. In the center of the picture is the road. It is still barely covered by snow. It can be assumed that this is early winter. On the sides of the road there are trees. They already managed to dress up in winter coats. Snow lies on each branch and creates the impression of some miracle. Aivazovsky is a true master. With the help of skillful selection of flowers, he manages to convey the special beauty of winter. Fluffy snow is impressive. He covered the trees with whole hats, woven from millions of snowflakes. If you think that for the winter landscape you need mostly white color, then you are mistaken. The artist uses in his painting shades of white, gray, blue, pinkish and even black. As a result, he manages to convey the special charm of nature and the ringing silence. His canvas is incredibly lively. It seems, even a moment, and we will feel the whiff of the winter wind and hear the rustle of the forest. On the road are two. Painter in detail does not prescribe them. One can only guess by the outlines of the figures that it is a man and a woman. They decided to go for a walk to enjoy the pleasant frost and see the beauty of this corner of nature. The majestic sky reigns over all this silence. It almost merges with the fluffy tree crowns. Aivazovsky depicts him with blue, blue and pinkish tones. The whole picture is illuminated with light. We feel that Aivazovsky does not just admire nature, but also wants to convey these feelings to us. 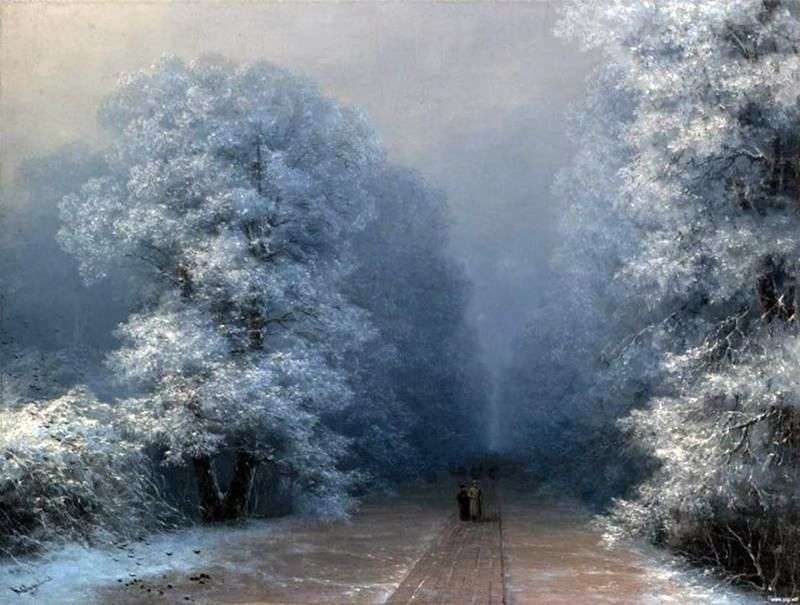 Description and meaning of the painting Winter landscape by Ivan Aivazovsky.